Our free and low cost food resources map is a quick and easy reference to find where hot meals, food pantries, community kitchens and more are available. This information is also listed under the Food resources tab on this webpage. The CFSA Final Report is now available. The full report can be downloaded here. 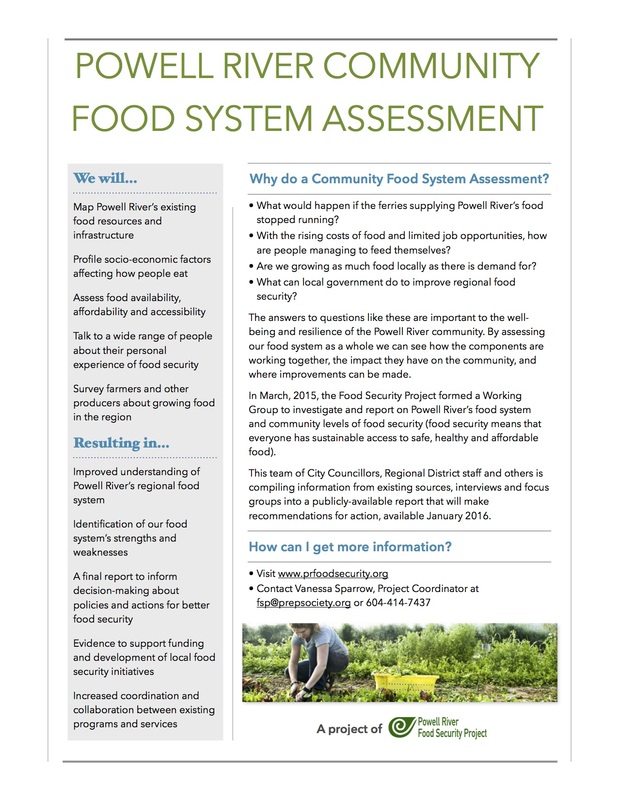 The Food Security Project is currently conducting an 8-month project to assess the current state of Powell River’s food system. In January 2016, the project Working Group will release a community profile of food security in the region and make recommendations for action. Click on the image below for a summary of this project. For more detailed information, please see the full background proposal here. This story is pretty inspiring, and sounds like where we could be headed in the Powell River region, with some more smaller farms springing up, a bit more awareness of the value of local food to the local economy, maybe some small businesses and value-added operations, and something like Helena Bird’s proposed teaching farm & market garden (AKA “Full Circle Farm”) to anchor the community around a central facility to provide a common infrastructure for production and processing. Cooperation takes many forms. Vermont Soy stores and cleans its beans at High Mowing, which also lends tractors to High Fields, a local composting company. Byproducts of High Mowing’s operation — pumpkins and squash that have been smashed to extract seeds — are now being purchased by Pete’s Greens and turned into soup. Along with 40,000 pounds of squash and pumpkin, Pete’s bought 2,000 pounds of High Mowing’s cucumbers this year and turned them into pickles. Somehow we need to start pulling in the same direction. Things seem very ragged and disorganized right now, largely thanks to the policies of large centralized governments, but helped along by societal forces that make farming an unattractive profession. It’s so bad now for small-scale farming that almost anything would help reverse the trend. Actually, it’s more like: Candy 1, Produce 0.96. But still, the fact that sales of candy, snacks, soft drinks (i.e., liquid candy), and (fergawdsakes) water is beating out sales of produce… well, there’s a ways to go before people are eating well in the USA. I don’t expect that these numbers are terribly different up here. In fact, comparative numbers from around the world would be pretty interesting. I think that if I had been asked to guess at how these numbers stack up, I would have predicted that produce sales are even lower in comparison to the junk food categories lumped together here. From pro basketball to urban farming… only in America! One of Wisconsin’s few African-American farmers, Allen, a former professional basketball player in the ABA, founded Growing Power in 1993 in Milwaukee to help teach inner-city kids about the origins of their food. It has expanded to include satellite-training sites in Arkansas, Georgia, Kentucky, Massachusetts and Mississippi. The group’s high-quality produce and grass-fed meats are sold through farmer’s markets that target inner city neighborhoods in Chicago and Milwaukee, where access to fresh food is often difficult and expensive. Here’s the link to the Growing Power website. 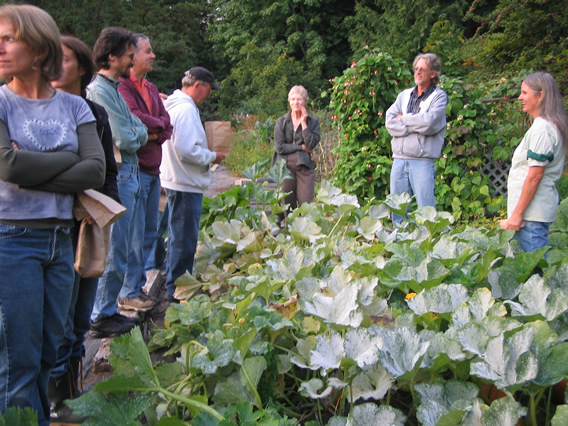 We had the September Kale Force meeting last night, one week late since I was out of town at the Sorrento gathering of the BC Food Systems Network last Wednesday. This month’s meeting was the follow-up meeting to July’s meeting when Wendy Devlin talked to the group about some of the basics of saving seeds. That was the classroom portion; last night’s meeting was the hands-on part. We met up at Wendy’s place, up in the far northeast corner of Wildwood, admired her ducks and rabbits and sheep, and then spent almost two hours wandering around in her garden, learning about the ins and outs of seed-saving. We looked at chard, beet, dill, cilantro, beans, various flowers, talked about gathering seeds from plants like cucumbers and tomatillos, and spent some time gathering seeds from Wendy’s cosmos (cosmoses?). It certainly adds a whole new dimension to gardening when you have to think ahead to saving seeds, since you have to consider distances between plants, accidental pollination, flowering times, and the tradeoffs between growing plants for eating and growing plants for seed. After that, some of us went down the road a piece to Heinz’ house and admired his incredible garden, built among the rock formations beside his house. Talk about making the best of a difficult situation for a garden! Heinz has trucked in large amounts of soil and amendments and created a very orderly and well-maintained fruit and vegetable garden. He has lots of strawberries, even this late in the season, which might be something to do with the fact that everything is surrounded by rock, which probably helps keep the garden from cooling down as much as it otherwise might. We enjoyed a nice potluck meal and conversation, and then called it a night. One thing that came out of the workshop was a renewed interest in creating a regional seed-saving effort, whereby people in different parts of town could tale responsibility for saving seed from particular plants and varieties. This might allow for isolating plants from cross-pollination and accidental hybridization, and would allow for some plants to be grown for seed in areas which are more conducive to those plants. For example, Wendy was having trouble getting some of her plants to set seed before the cool damp weather starts; but in drier warmer parts of Powell River it should be possible to extend the growing season by a couple weeks or more. So, this winter, as we continue to meet (second Wednesday of every month at 5:00 PM at the Community Resource Centre! ), we will hopefully be planning a little network of seed-savers around the area, divvying up responsibility for seeds from various plants, and using these seeds to feed into Seedy Saturday. Perhaps over time this will evolve into a seed company or cooperative.